Helping your child learn and grow through trusted child care services and progressive early childhood education. Kids' Point serves children 2 weeks - 5 years. Call Michelle Croomes at 316.260.4673 for a tour. Kids’ Point is open 7 a.m. until 5:45 p.m. Monday through Friday with the exception of major holidays and 3 staff training days each year. Tuition for an infant 0-12 months is $235 per week. For children 12-30 months and walking alone the tuition is $200 per week. Tuition is $185 per week for preschool classrooms (30 months-kindergarten age). Growing thriving, healthy plants is no easy task, but in the expert hands of a master gardener, magnolias become masterpieces. And so it is with the child care and preschool program at Rainbows United--nurturing and encouraging each child to grow to their fullest masterpiece potential. We’re committed to providing a quality child care and preschool education for your child. Fostering a strong school-family relationship brings the educational experience full circle by bringing together each individual who is invested in growing potential and guiding your child. Download an application pdf to the right. Preparing your child to be successful in school is at the forefront of our program. Regardless of age or skills level, your child will graduate from Rainbows’ Kids’ Point early care and educational program fully prepared for a successful Kindergarten experience. Rainbows United is committed to providing a quality preschool education for children. Each day, the highly trained staff provides each child with the learning needed for school success. 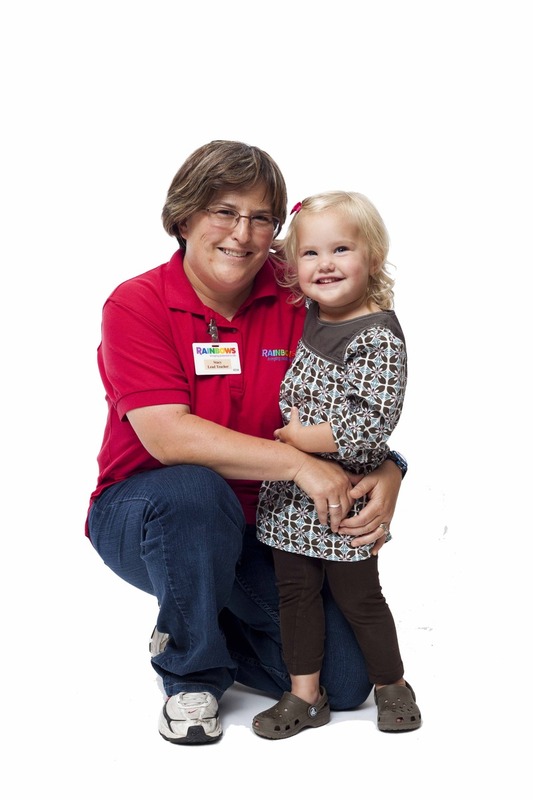 Fostering a strong school-family relationship brings the educational experience within a Rainbows United preschool program full circle by bringing together each individual who is invested in guiding children to reach their fullest potential. If you are interested in learning more about the Rainbows United Kids' Point preschool program, please contact us at 316.267.KIDS.5437. Our Kids’ Point location offers child care for children ages 2 weeks to 5 years regardless of ability. We have the resources to care for children who are typically developing, have challenging behaviors or other special needs. Meals at Kids’ Point are made from scratch as often as possible. Children also have the opportunity to try out cooking themselves. While making dishes like applesauce, they get to smell the cinnamon, measure the butter and stir the apples. Throughout the year there are many opportunities for parents to participate in fun activities with their child during field trips, donuts with dad, muffins with mom and field days. Each classroom has a door that leads directly to a fenced playground area. There is plenty of room to run, play and have lessons in an outdoor classroom. Nurse Shirley is a great resource for parents with any health related questions. She also makes visits to the classrooms to educate children about healthy habits. At Kids’ Point (located at K-96 and Oliver) we are open from 7 a.m. to 5:45 p.m, Monday-Friday. Parents may visit their child’s classroom at any time. The Kids’ Point custom-designed building has an open concept for classrooms with half walls, a large layout and a door in each room that leads to an outdoor classroom and playgrounds. Each classroom is taught by a lead teacher certified as a child development associate and is assisted by two qualified paraeducators. Classes are centered on evidence-based learning directed by a child’s interests. We embrace active, intentional and purposeful learning in our classrooms. Download a Child Care Request form from the Downloads section above. Or download a Re-Enrollment packet from the Downloads section above. Call Michelle Croomes at 316.260.4673 to schedule your enrollment appointment. Schedule your enrollment appointment with Michelle.